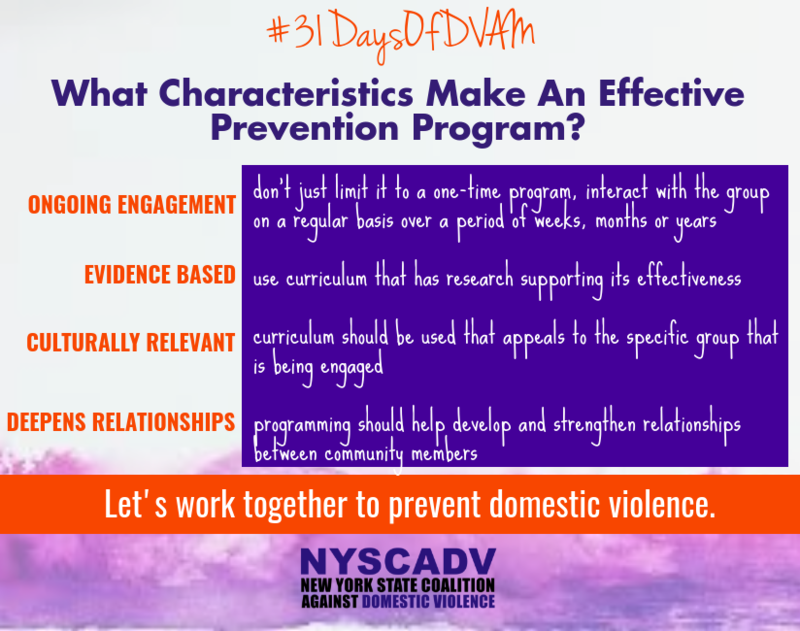 During #31DaysOfDVAM social media campaign, we highlighted domestic violence awareness and prevention related statistics, resources, and issues each day in October. For the higher quality version of these images to share on Facebook and Twitter, click here (Zip file /31 Images). 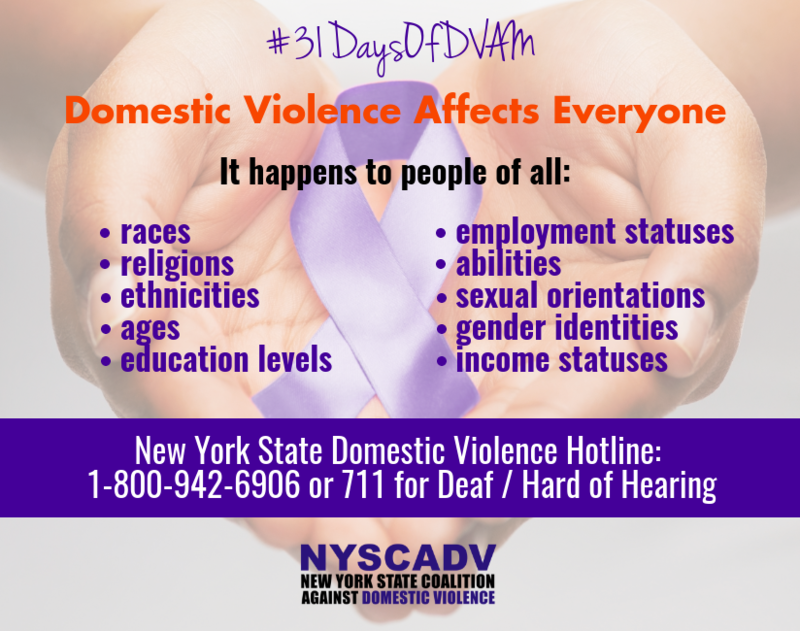 We just started another Domestic Violence Awareness Month, but the number has not changed for New York State. 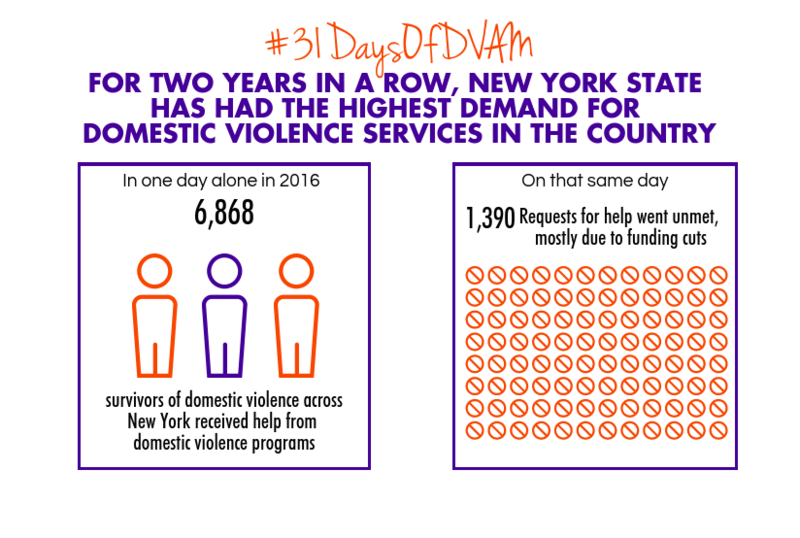 #DVCounts indicates for 2 years in a row our state has had the highest demand for domestic violence services in the country! 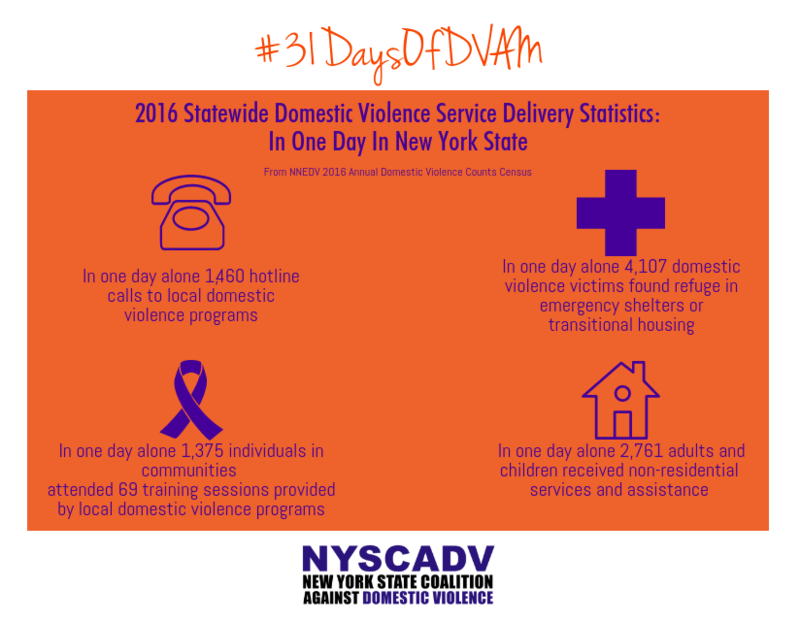 New York State response to survivor's need according to #DVcounts. 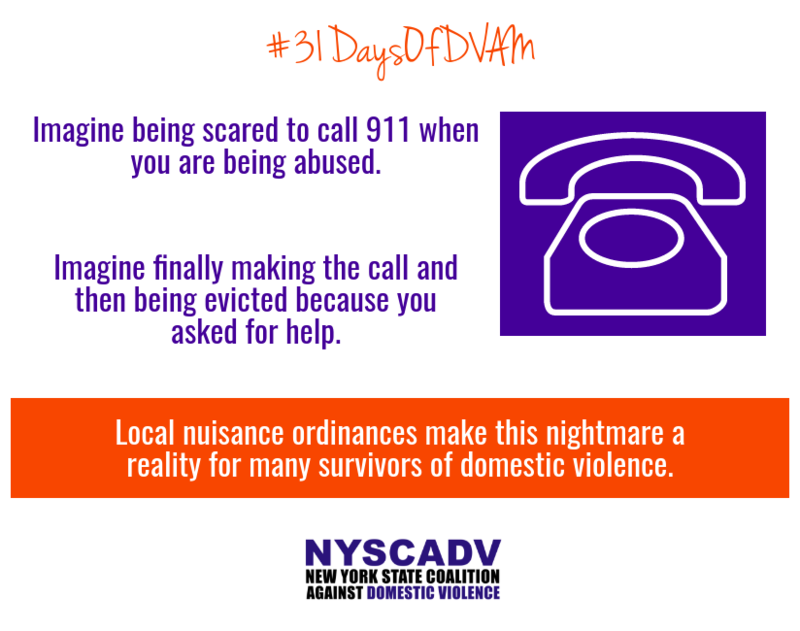 Sometimes victims of domestic violence have to choose between calling for help or keeping a roof over their heads. learn more about our efforts to change these unjust local laws. 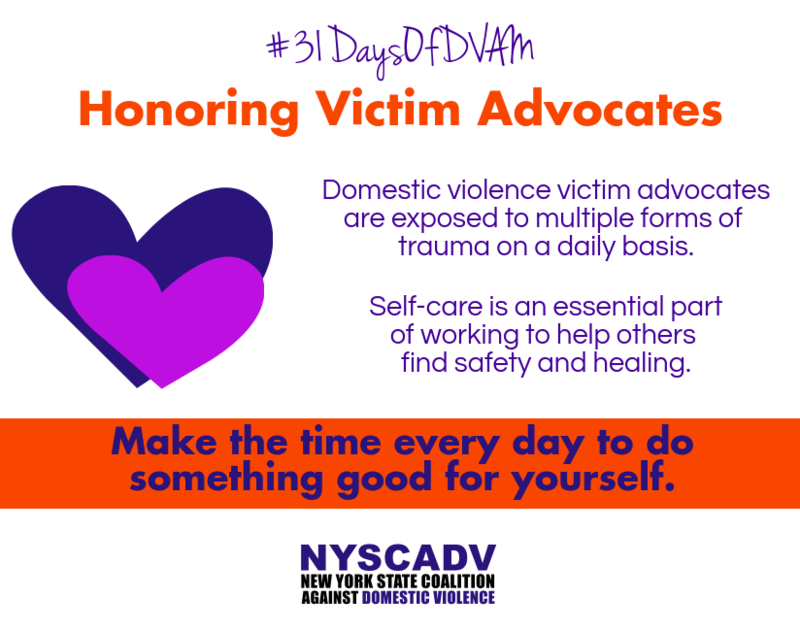 Advocates are the essential part of ending and preventing domestic violence. They carry stories and experiences of working with survivors in their hearts. 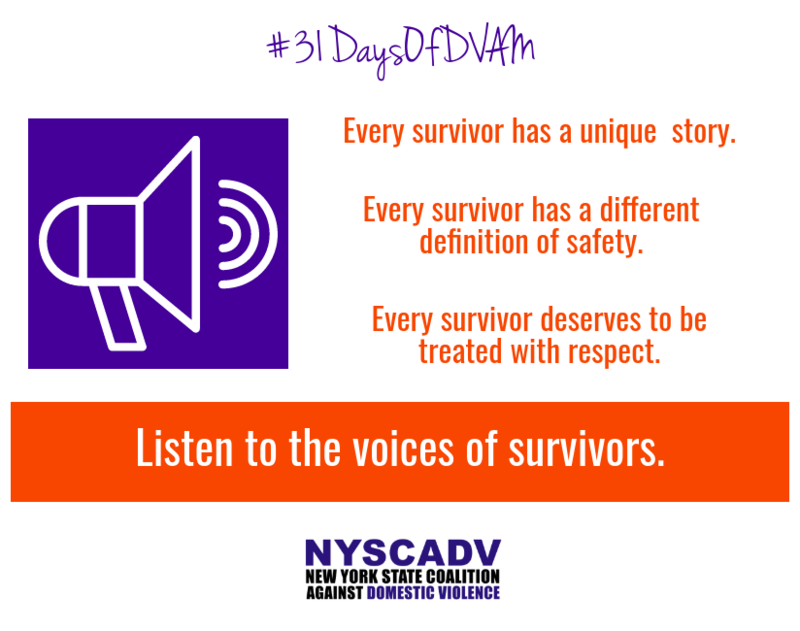 Today we honor victim advocates who are exposed to different forms of trauma. Self-Care is critical in our path of helping others finding safety and healing! 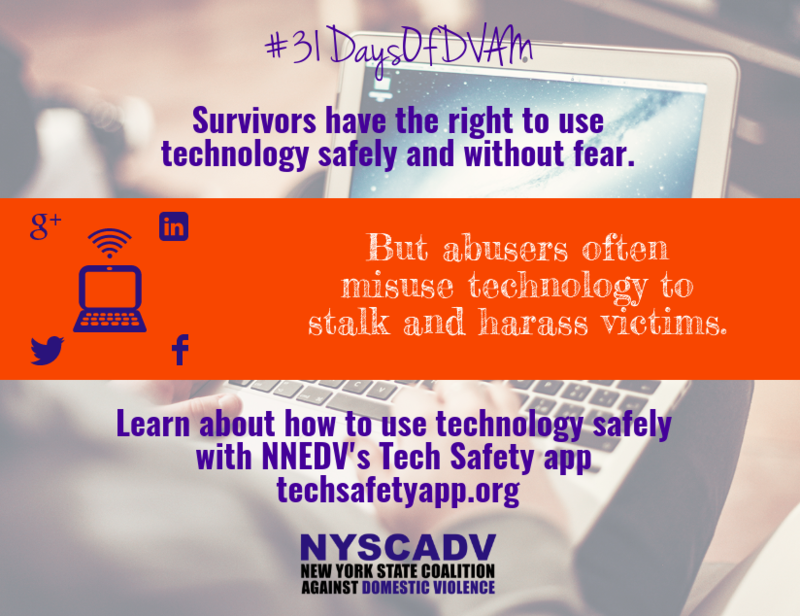 Survivors have the right to use technology and social media safely and without fears but sometimes abusers misuse technology to monitor, stalk and harass victims of domestic violence. 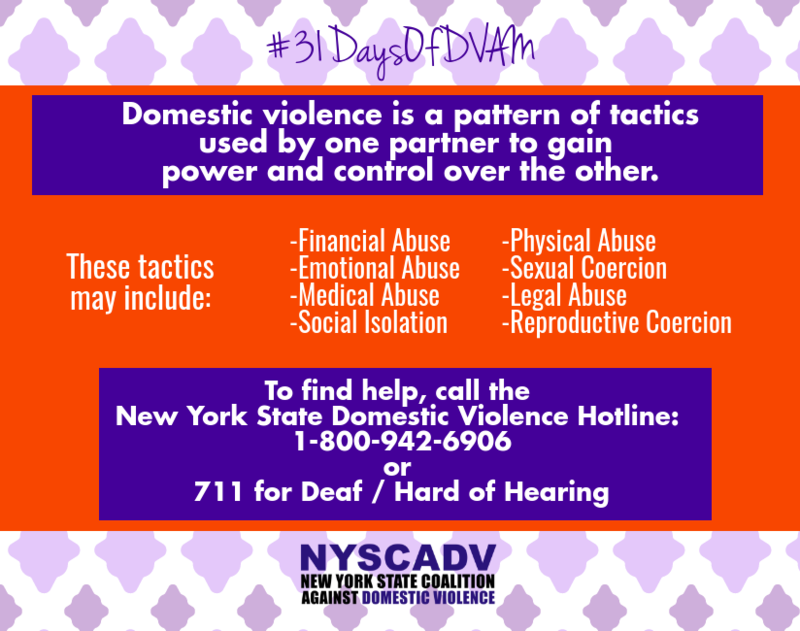 Abusers use a variety of tactics to gain and maintain power and control in their relationships. 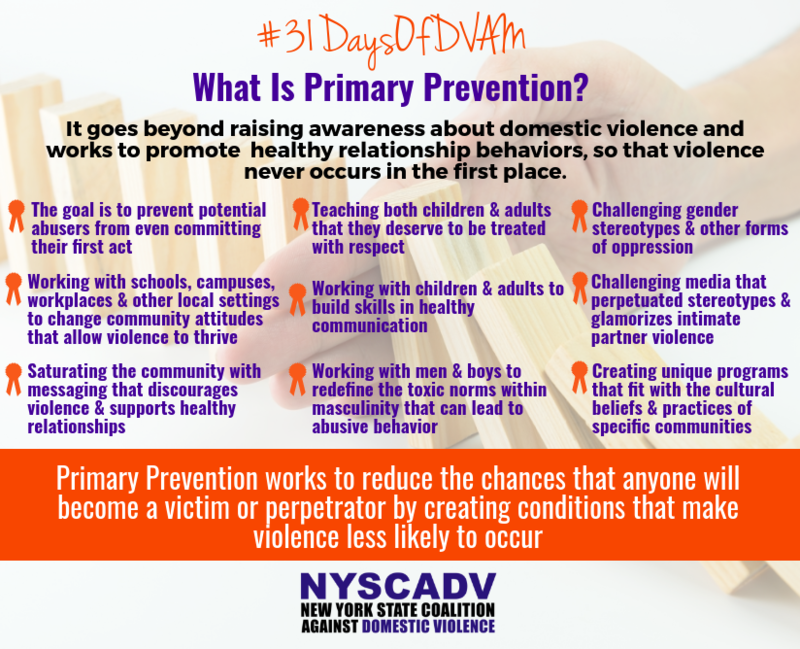 It is important to note that abusers choose to perpetrate these acts and those acts are not the result of their partner’s behavior. 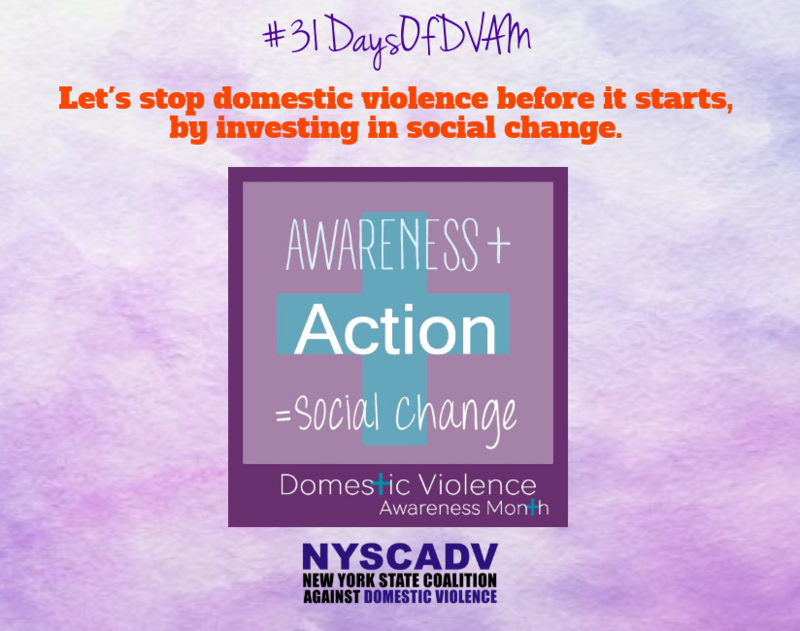 In 98 percent of domestic violence cases, victims will experience financial abuse, which means their abusers will deny them access to money and financial resources they need to break free. 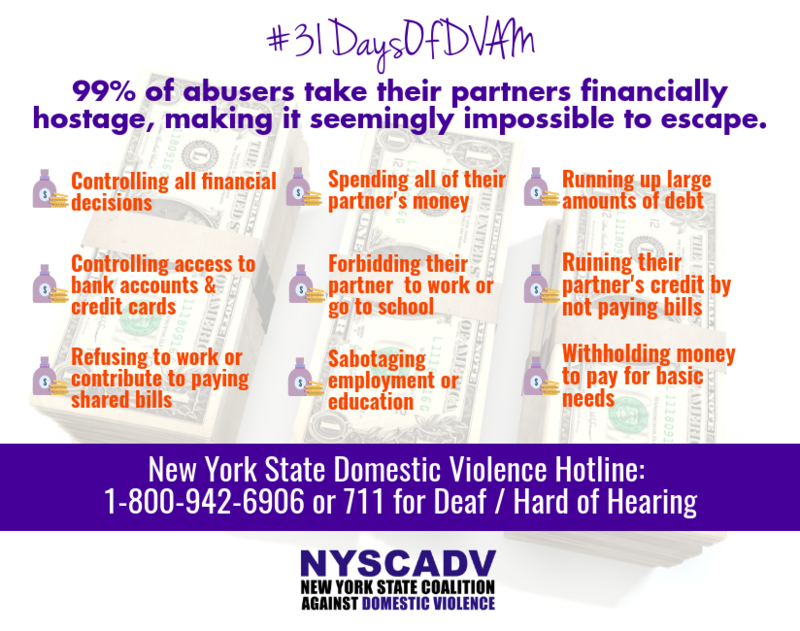 Financial abuse is one of the primary reasons domestic violence victims stay in or return to abusive relationships. Without resources of their own, victims are often unable to care for themselves and their families, find employment and housing, or save for the future. 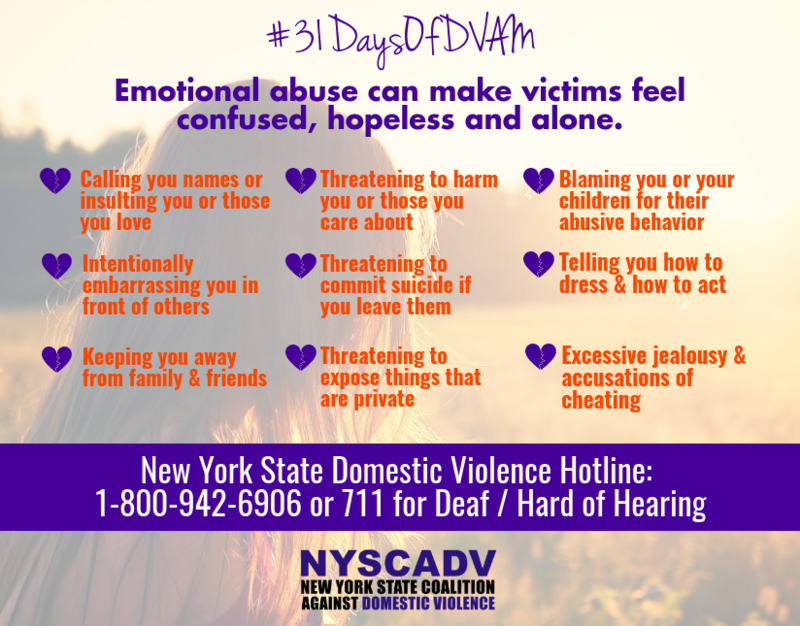 Emotional abuse can make victims of domestic violence confused, hopeless and alone. This form of abuse usually ruins confidence and self-esteem. Today is #WorldMentalHealthDay and we want to highlight the importance of survivors proper access to healthcare without fear or control. 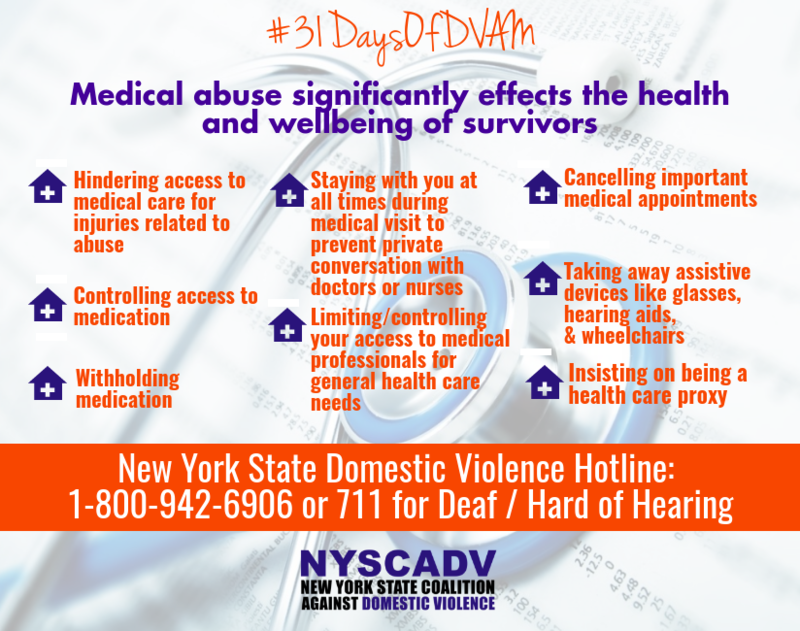 Experiencing physical and emotional abuse causes lifetime trauma and endanger survivors wellbeing. 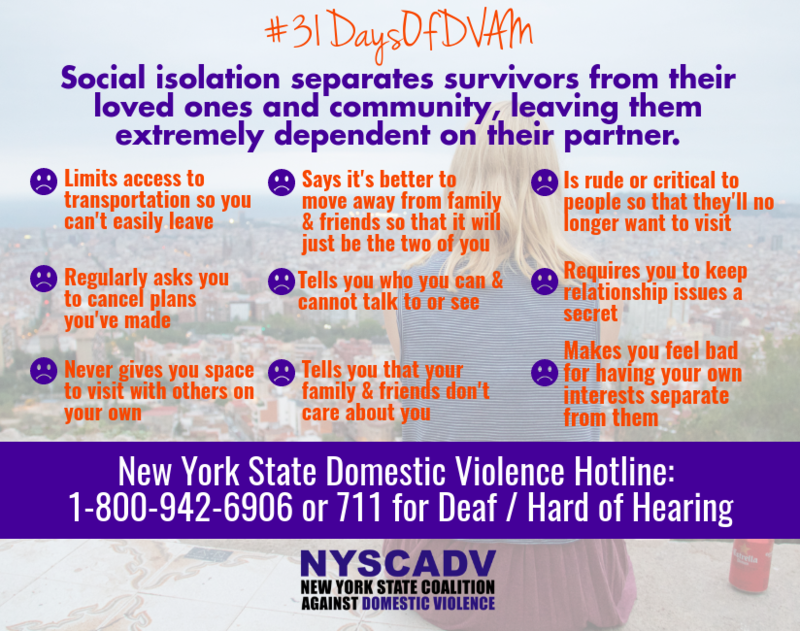 Social Isolation cannot be separated from domestic violence. Abusers use this tactic to maintain power and control over survivors and prove themselves as the most important person in victims' lives. 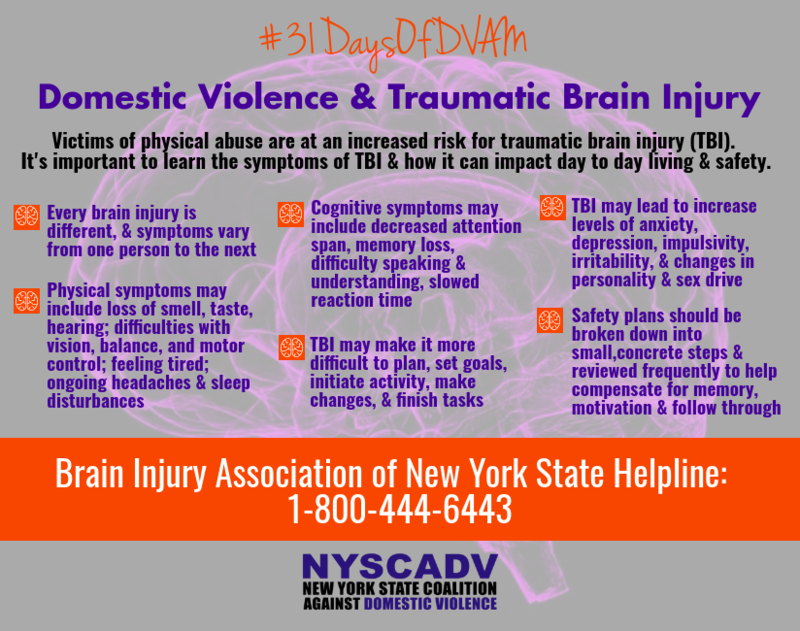 Victims of physical abuse are at an increased risk for traumatic brain injury, and often go undiagnosed. It's important to learn the symptoms of TBI & how it can impact day to day living & safety. Whether you're married, in a serious relationship, casually dating, or just hooking up, you never owe sexual intimacy to anyone. You should always have a right to determine what you are comfortable with doing sexually. 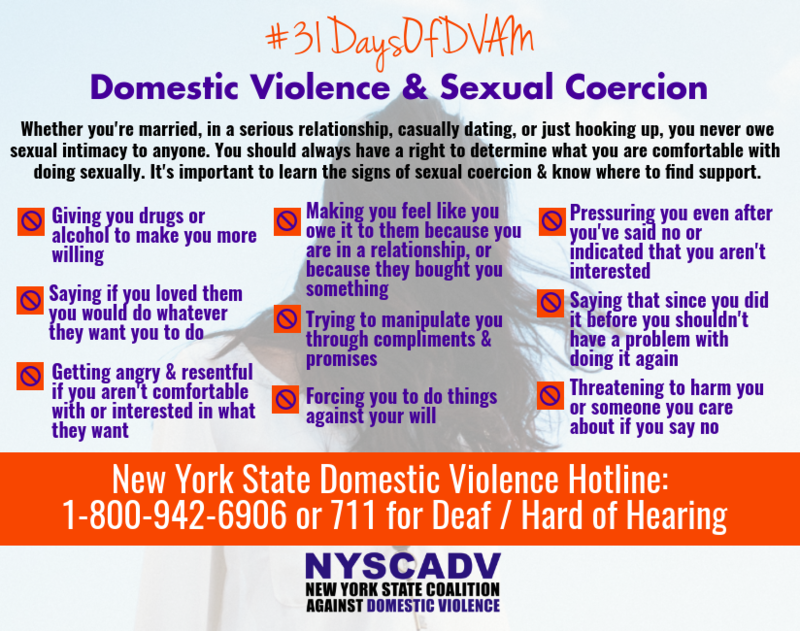 It's important to learn the signs of sexual coercion & know where to find support. 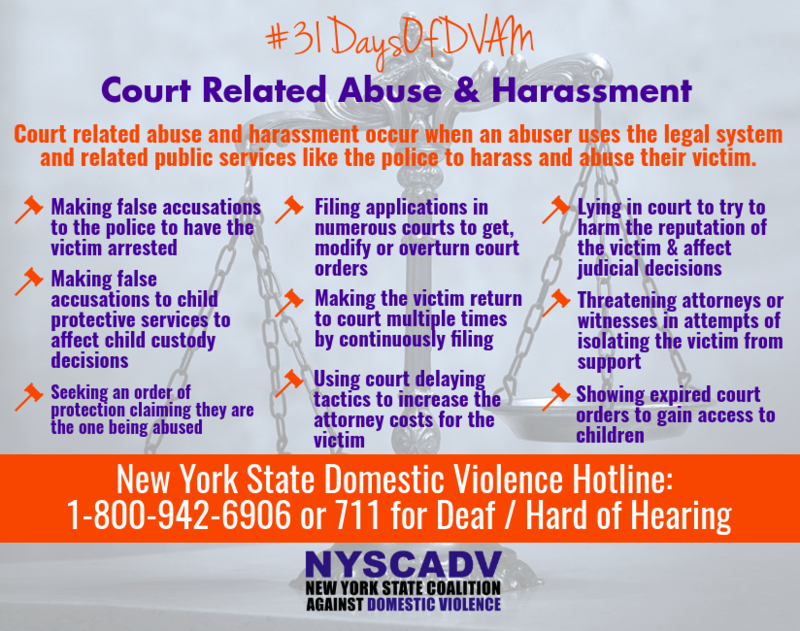 Court-related abuse and harassment occur when an abuser uses the legal system and related public services like the police to harass and abuse their victim. 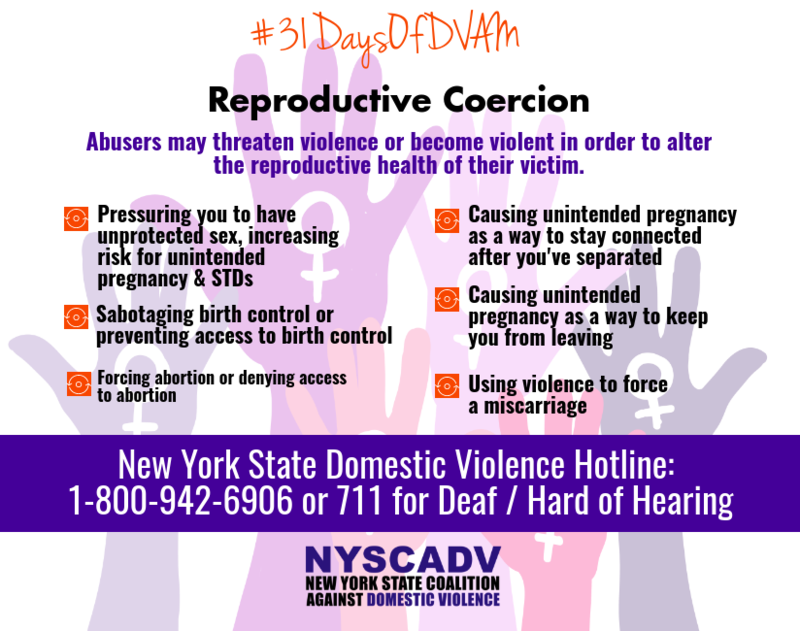 Reproductive Coercion happens when abusers threaten violence or become violent in order to alter the reproductive health of their victim. Domestic Violence affects everyone. It impacts people from every community and is perpetrated by abusers from all socioeconomic backgrounds and education levels. 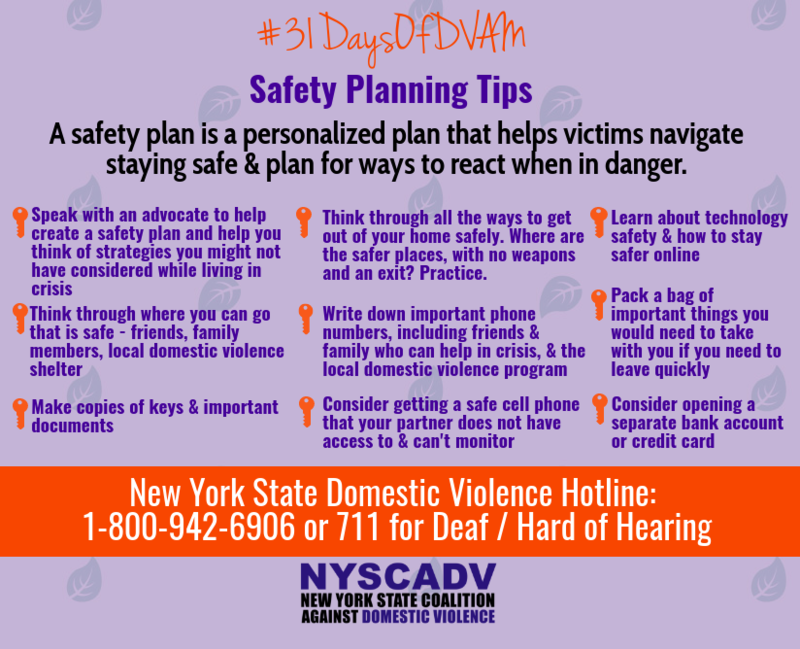 We all know leaving an abusive relationship is the most dangerous time for domestic violence victims. This shows the importance of safety planning. Domestic violence and the media! 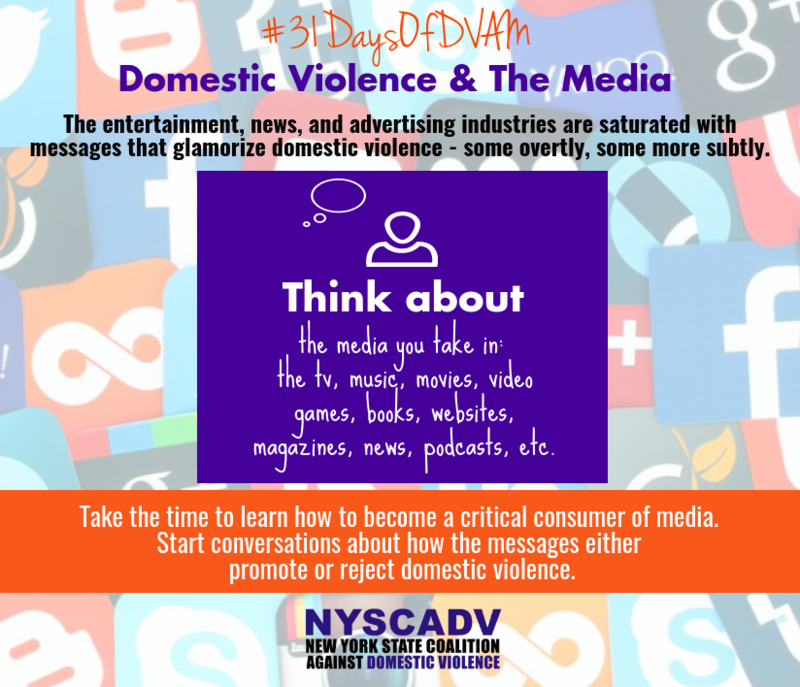 The entertainment, news, and advertising industries are saturated with messages that glamorize domestic violence - some overtly, some more subtly. promote or reject domestic violence. 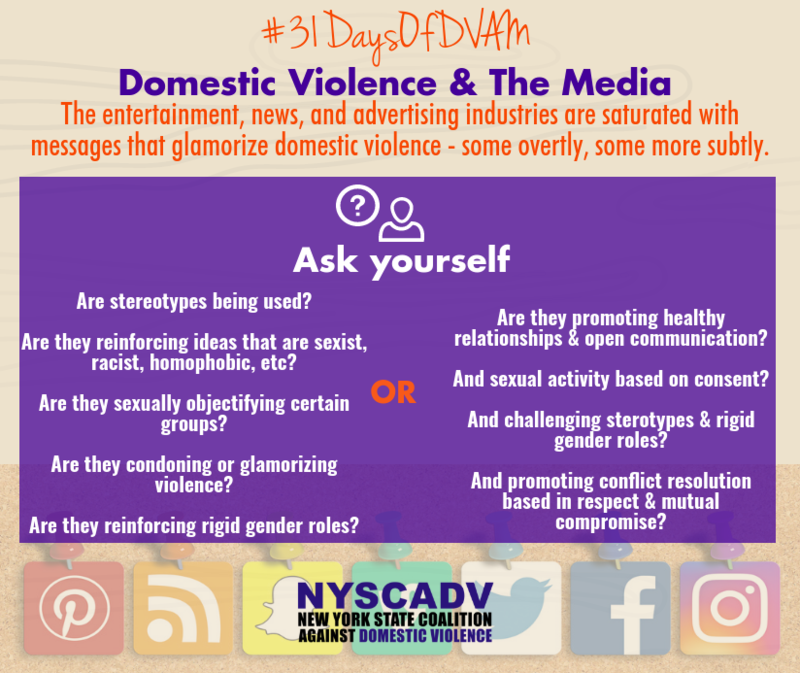 Domestic violence and the media! We need to ask ourselves if the media we take are glamorizing domestic violence or are they promoting healthy relationships and open communication? 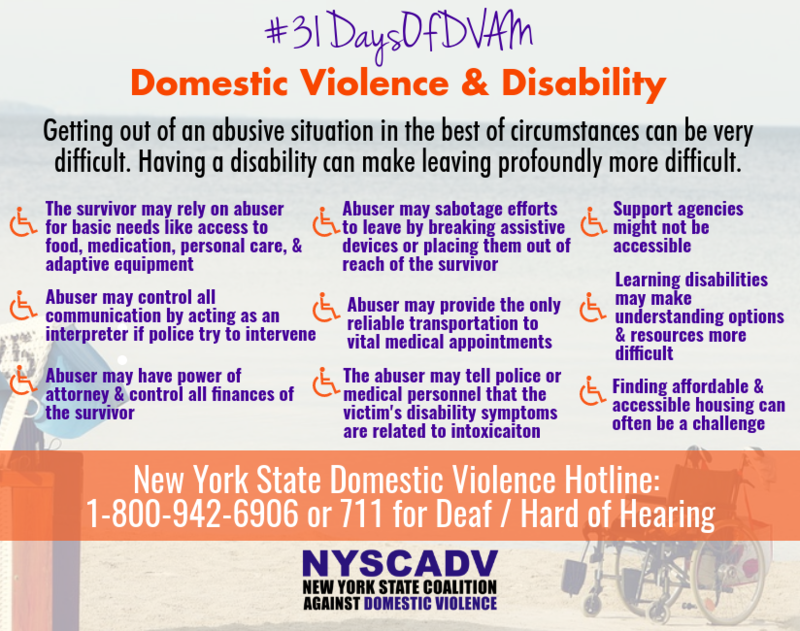 Getting out of an abusive situation in the best of circumstances can be very difficult. Having a disability can make leaving profoundly more difficult. 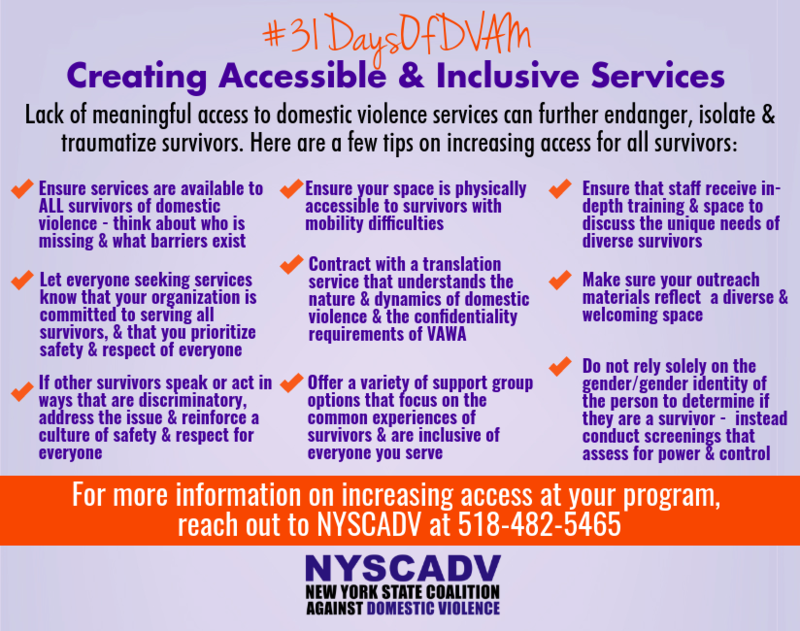 We need to address barriers that victims with special needs may face. 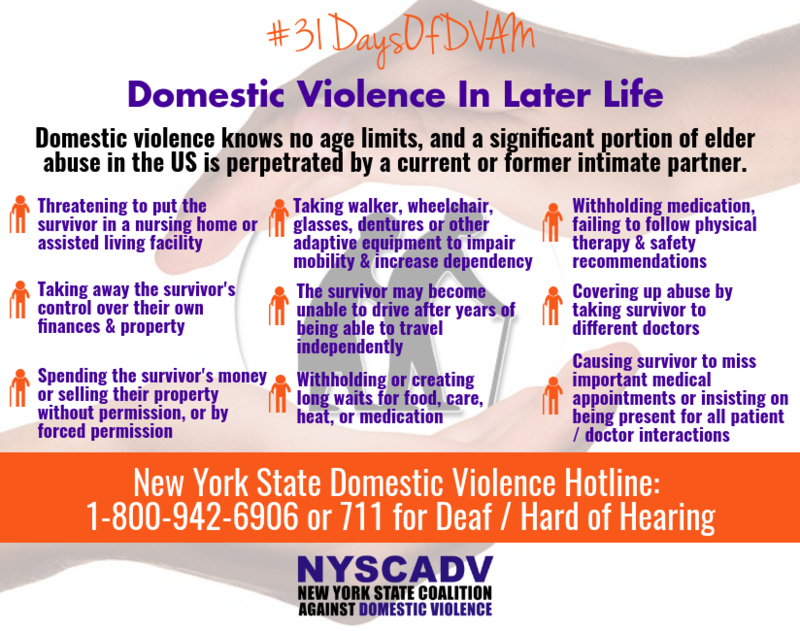 Domestic violence knows no age limits, and a significant portion of elder abuse in the US is perpetrated by a current or former intimate partner. For more information about abuse in later life check out National Clearinghouse on Abuse in Later Life - NCALL. 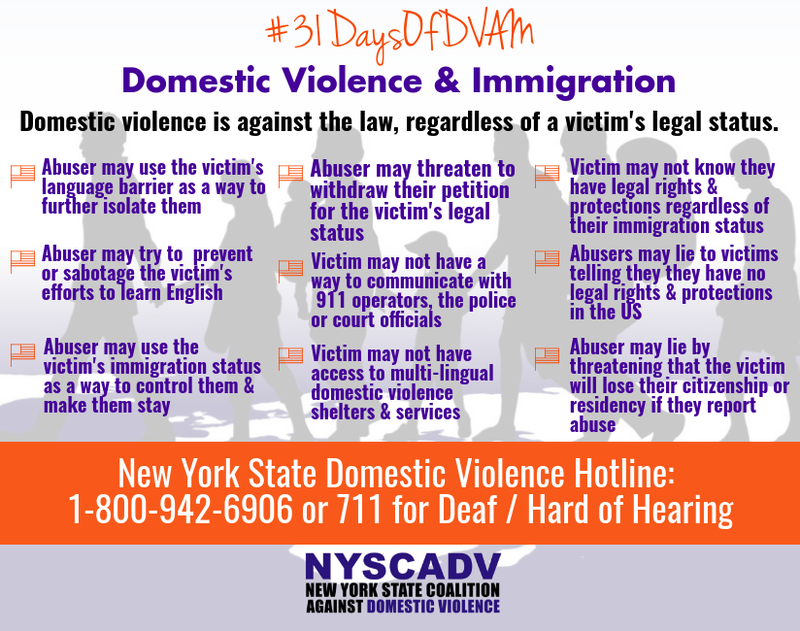 Domestic violence is against the law, regardless of a victim's legal status. 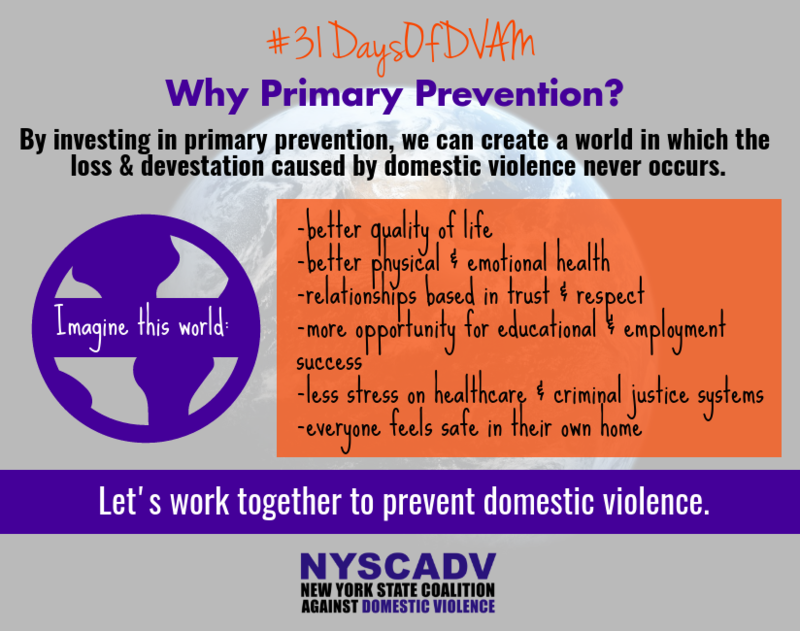 Though DVAM 2017 is coming to a close, the work to end domestic violence is far from over. 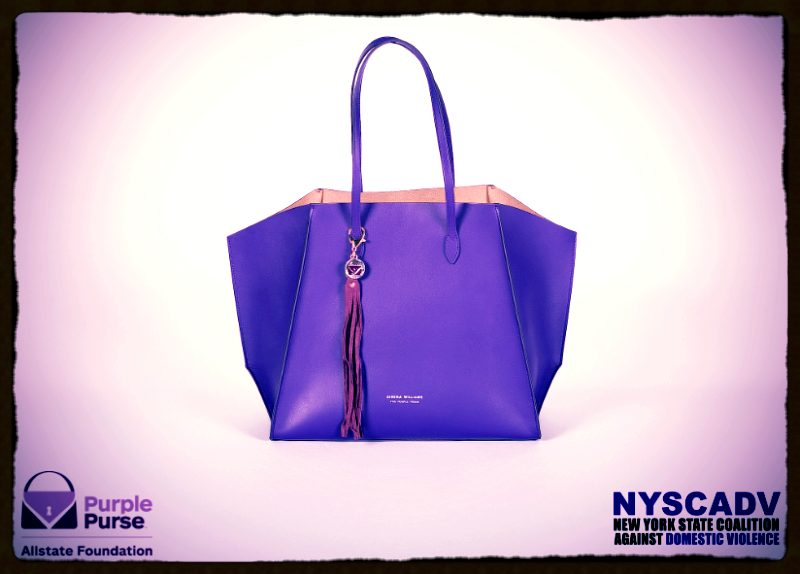 This year throughout domestic violence awareness month, NYSCADV has participated in Purple PurseChallenge to raise awareness and funding. 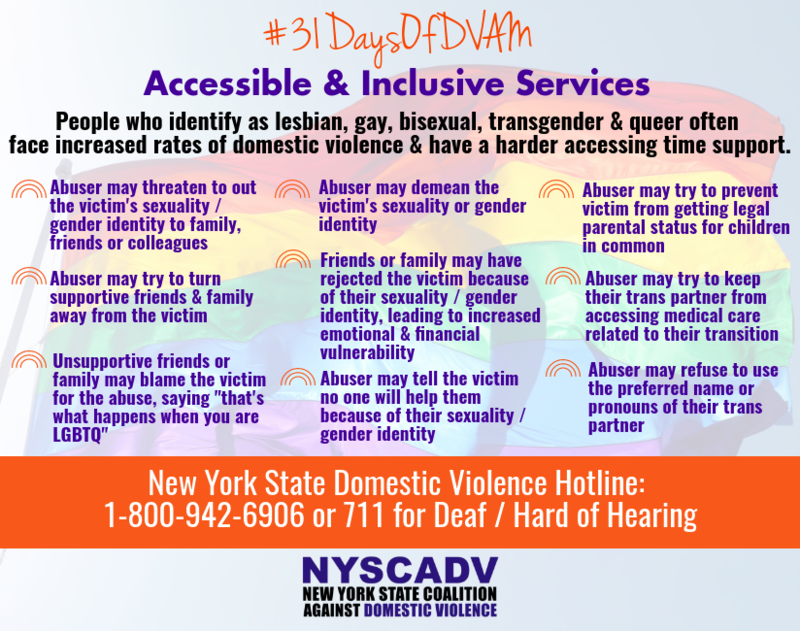 People who identify as lesbian, gay, bisexual, transgender and queer often face increased rates of domestic violence and have a harder time to access support. 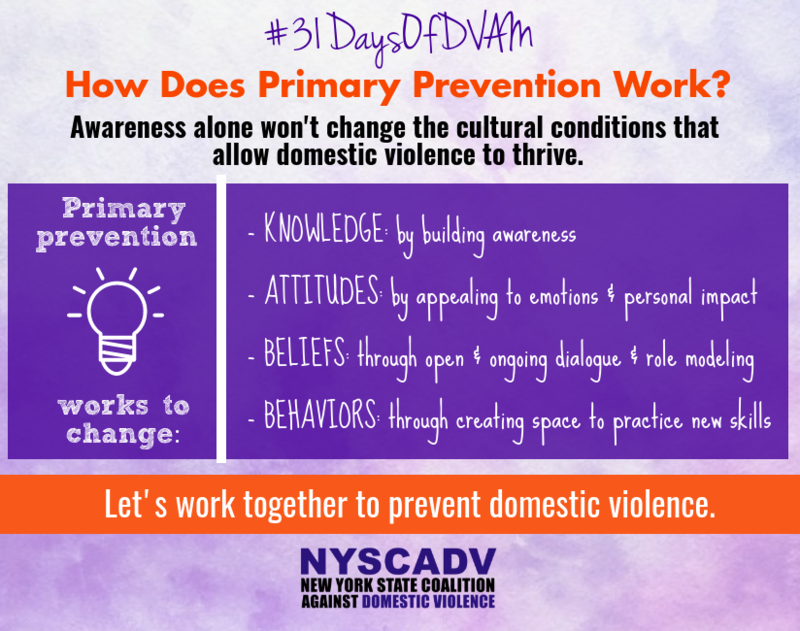 n the last day of Domestic Violence Awareness Month, let's not forget that we can end and prevent domestic violence by raising awareness and taking action.